The story of the Purple Bus. 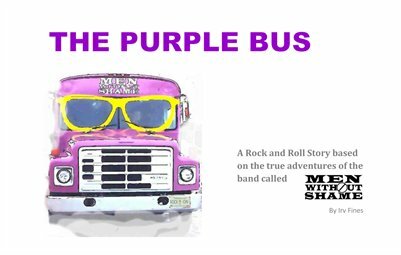 This book is based on a true story of the band called Men Without Shame and their infamous Purple Bus with yellow sunglasses making the journey to a classic rock festival near Minnedosa, Manitoba. The band meets their musical heroes and have to overcome their insecurities as they share the stage with giants of the music business for the first time. Lots of actual photos are used to illustrate. A fun read for kids and adults alike.